Incorporating the same technology used in top-selling Serta mattresses, the Serta Big & Tall Executive Office Chair brings the Serta legacy of quality, comfort and style to your office. Specialized Premium Ultra foam makes up the Smart Layers that are placed over individual pocketed ComfortCoils, offering pressure-relieving comfort and optimized support for an unrivaled seating experience. The deep, layered body pillows on this leather office chair wrap you in softness, creating a plush-like feel that takes you comfortably through your day. Designed to help alleviate strain and discomfort, this ergonomic office chair has an elevated headrest to support your neck. 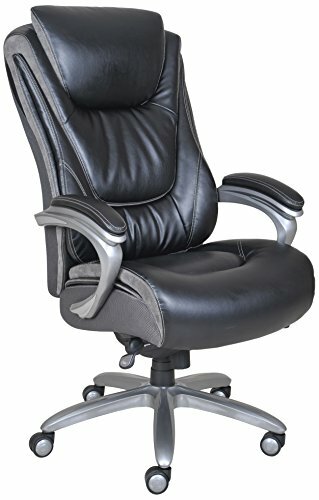 This big and tall office chair accommodates up to 400 lbs and has a generous, roomy seating area so you can stay focused and productive without feeling constricted. A 10-year limited warranty and commercial grade components like an extra-large steel plate and thicker plywood ensure this heavy duty office chair stands up to heavy use. A great addition to your executive décor, this Serta office chair is finished in a supple bonded leather for commanding style that highlights success. If you have any questions about this product by Serta, contact us by completing and submitting the form below. If you are looking for a specif part number, please include it with your message.